The upcoming 3DS XL packaging in Europe may say in big letters that an AC adapter is not included in the box, but that won't stop complaints on the internet and a few confused customers. It was a decision taken, apparently, to make the console more affordable, with adapters and cradles available to buy separately: some will be unhappy, though, at the idea of paying extra for the privilege of charging their shiny new handheld. 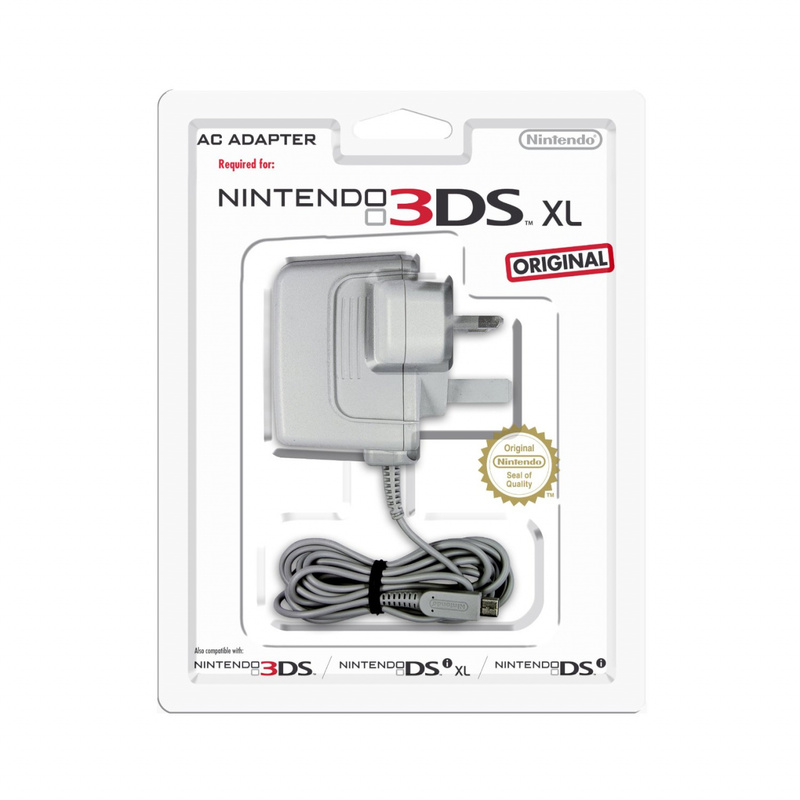 Japanese 3DS XL/LL buyers face the same predicament but, as reported by Andriasang, the AC adapter is having a price-cut from ¥1,500 to ¥1,000, potentially to ease the complaints of 3DS LL buyers. If you're planning on an XL purchase in Europe, it'll be interesting to see whether pricing is generous on the extras. At the time of writing Amazon UK is taking pre-orders on a power adapter (no cradle) for £6.99, release date 28th July, while game.co.uk is optimistically pricing the AC adapter and cradle at £4.99, but it's listed as 'out of stock' so that pre-orders can't be placed. It'll be a waiting game to see what kind of price retailers settle on for these chargers and cradles. Well I suppose that makes things slightly better. Still, it's ridiculous that you CAN'T CHARGE THE THING OUT OF THE BOX. Perhaps 2 separate bundles for people who own a charger and those who don't would be more appropriate? That's bad if I want to play a 3DS XL the I get I want to. I'm not getting the 3DS XL sorry Nintendo I'm a Nintendo fan and a Sony fan I got a wii NES N64 3DS and I'm getting a PS3 soon. I still don't understand how not including a AC adapter is saving Nintendo any money. The only time where that makes sense is if the console runs off standard batteries. I think the only reason the US is getting the adapter included is because Reggie (or someone in the handheld division) was 1) smart enough to know this is a stupid idea or 2) knew the backlash from US consumers would be immeasurable. I can already imagine the lawsuits and BBB complaints filed against them. Not including an AC adaptor with the XL is one of the dumbest things I've ever come across. The only such adaptor I have is the one for my 3DS. I had been considering trading in my current 3DS and upgrading to the XL, but then I would have to buy an adaptor. I wouldn't go so far as to say that the absence of an adaptor alone made my decision not to upgrade, but it was certainly a factor. This is one of the few times NOA gets it right, with the AC Adapter being included with every 3DS XL. I'm sure Reggie wouldn't let us buy it without the charger. I honestly don't understand all the comments about this. It's clear that the box doesn't include a charger. It's plastered all over the front, back and sides of the box. It's really quite easy to pick up a charger at the same time you buy your console, if required - however, and I think Nintendo feels the same, there's a pretty high chance that people buying the XL will have a DSi charger already. Get over it. It's not like you'll come home to find they omitted a charger without telling you. Buying one extra item (that's cheap as chips) isn't the end of the world, and it's also better for the environment. Less unnecessary plastic floating around. It feels like people are being the typical 'gamers outraged and anything and everything' just for the sake of it. Name me ONE good reason why this is a major problem. @Wheels2050 Because Nintendo's reason for not including it doesn't make much sense. If the adapter is so cheap, why can't it be included with the system? Nintendo has them in bulk so it costs them less to include it than it does the consumer to buy it. Has anyone confirmed if the port is differently shaped? Combatability is the ONLY reason I can see not including one. And in the UK the price of a charger will go up to a bargain price of £14.99. We love you a little bit Europe. @GumbyX84: It makes perfect sense to me, from their point of view. If it costs them say $1 to include a charger in every box, assuming they don't change the price, then that's $1 less they make on each 3DS XL they sell. It doesn't sound like a lot, but once you sell millions of consoles it adds up. If, like I'm pretty sure Nintendo are, you assume that many of the buyers will already have a charger, it makes little sense to throw away an extra dollar on each console. Making a small profit on the chargers that people will actually buy is better than cutting into revenue. @Rect_Pola: It's exactly the same as the DSi and 3DS port. Oh good, then it's not a huge issue (except for total newcomers, they can be pissed). @Wheels2050 Yes it could save them millions but is saving $1 per system worth the frustration of your customers? Customers who are already baffled by the release of a new version of your new flagship console less than a year after release? Is NoJ and NoE really hurting for money that badly? If so, they have a lot more problems to worry about than saving $1 per system sold. I don't understand why we in Australia (a pal region and a market that usually follows European gaming conventions) get an AC adapter and you guys in Europe do not! Maybe us Australians and Americans know how to nag better?! @GumbyX84: To be honest, I think customers who get frustrated over this are being extremely petty. The only way I can see this being a problem is if the store you are buying the console from has run out of chargers. That would be annoying. Anyone else would just buy the console, and grab a charger as well if necessary (which any store with an ounce of sense would have hanging up next to the consoles). People are blowing it way out of proportion. @wheels: It costs the consumer extra to purchase something that is REQUIRED to use with the system, and you're asking why people are complaining? @LztheBlehBird: It is an unusual move, I'll certainly admit that. I imagine, however, that the price of the box would go up if they included a charger. This way it's cheaper for everybody, and people don't end up with extra chargers. I don't imagine, IN PRACTICE, that it will be a significant issue. I'd like to see an honest poll to see whether the people who are complaining about this already have a compatible charger. I imagine it's almost all of them. so instead of shipping one product, they have to ship two? @LztheBlehBird Agreed. Its a required piece of equipment. THAT is the major issues here. I understand where Wheels2050 is coming from, but I still don't think that is a valid excuse. I can see NoE (and maybe NoA) back-peddling and offering a rebate/refund to customers who had to buy an extra adapter. @Wheels2050 Again, it doesn't matter if we have one already. It is precedence it sets. Nintendo thinks saving a few bucks is worth more than its customers getting a complete package. Is that really the message Nintendo wants to make to new buyers? If any other company did this, people would complain. There is no reason for it. While I have a DSi XL and 3DS, I plan on selling one (or both) in order to pay for my XL. So where does that leave me? Since Nintendo isn't seeing the money from me selling my older systems they can withhold a necessary component in order to make up for it? That is how it feels for me. You ask that we see if from their and your point of view, so why can't you look at it from ours? They should have just allowed for two versions. One cheaper without the inclusion of a adapter and one more expensive including the adapter. @Wheels: Ok! Let me trade in my old system and oh wait...I have to trade in my charger too?! I have no extra now! Are they dropping it to $0.00? Selling a 3DS XL w/o a charger is like having a 4th of July cookout w/o a grill. I wish they would have tried this in the US as it would have been fun to watch the lawyers make money via class action lawsuits. It would have also been fun to look at the big discount bins of DS "phat" chargers placed in front of the 3DS XL boxes and watch the cashier try to explain that the DS charger doesn't work w/ the 3DS XL. Anybody know if the Wii U will have a power cord in the box if it works with the Wii power cord? I mean, nobody would buy a Wii U who doesn't already own a Wii, right? I don't know if this is the stupidest thing ever but it is worse than "Mission Accomplished" and that's saying something. Apple do a similar thing with their I-Pods, you don't get a wall charger in the box but you get a USB cable which can be used for charging if it's plugged into a usb supported device, perhaps a similar approach would have been better. Of Course this wouldn't be an issue if Nintendo just used Micro USB like nearly every other portable device. @Crafton Actually iPods are made to not charge with USB wall chargers that aren't Apple certified. The iPod checks for a signal sent out by the charger. If it doesn't receive it, it refuses to charge. @Gumby sorry, by USB supported device I meant something with USB ports like a computer or an Xbox. Chargers make the whole thing go up by $15.00. You can buy one in the store for $10.00, but their gonna be dropping prices. Maybe they'll drop it to $5.00. @YelloWishua May I ask how you came up with that number? Because that makes no sense. How does it not make sense? You think you made sense when you said "Nintendo has them in bulk"? They have to make them! @Thomas Actually, I respect them for NOT including the charger. For me, its a matter of not letting materials go to waste. Here so many people already have chargers, and just including them in a box means that all of the 3DS owners who are merely upgrading will have an extra. Its wasted materials. They actually gave me the option of doing this with my phone here, since I had an old phone from the same company. The phone from my company actually didn't come with a charger either, so its not a unique situation here. I think there's a small but growing movement within companies here to not give out unnecessary materials because of waste. Besides, it's cheaper to buy one ALONE than with the system. @YelloWishua Manufactures do not usually sell accessories at that much of a loss. Also you had a very specific manufacturing cost which is rather odd. And Nintendo does have the AC adapters in bulk. They do make them, but I doubt very much that all the parts and labor to manufacture a single adapter cost them $15. Unless you have information to back up that claim, its just hearsay. @Tsuchinoko So what about people who don't have an adapter? @GumbyX84 I'm sorry, can you be more specific with your question? I'm guessing you mean with the 3ds? Just like with cell phones, you buy the adapter seperate, but they usually are cheap. I just looked online and its being sold at half price right now in Japan. @Gumby: I am seeing it from your point of view. If I was to buy an XL without a charger, I'd just buy a charger. End of story. If we knew that the price would have been the same regardless of whether or not a charger were included then that's a bit rough. However, you would never get a charger for 'free'. Everything in that box is accounted for in the final price. Besides, desktop printer manufacturers have been doing this for years. Most printers you buy don't include a printer USB cable, making it useless unless you get one separately. They just figure that enough people already have a cable to make one in the box redundant. Also, if you watch an unboxing video you'll see that there is almost no free space inside the box. Adding a charger would increase the box size, waste space, and ultimately end up raising prices over the cost of the charger itself due to the extra shipping required. @Wheels2050 Exactly. Like I said, the amount of people here that already have 3DS is HUGE, so its both a logic issue, and an eco issue. Its wasteful for both the companies and people to have extra materials wasted. Most people can just go to the store and buy them at the same time. I don't see any reason to complain about it. I understand that sometimes if you don't already have a device like this, buying something extra seems like a waste, but just imagine for the people that already have one, it must be a pain to have an extra adapter lying around. I fear many people would throw one away, and that's not good. @Tsuchinoko Cell phone chargers from the manufacturer usually aren't cheap. An USB charger for the iPhone/iPad/iPod is $29 direct from Apple. IMO that is not cheap. As for people throwing away AC Adapters as they don't need it: While this is a possibility, it is just as likely they will keep them. Hell people usually trade them in for a few bucks. Look at your local (corporate) video game retailer. @Wheels2050 Are you sure that is why they don't include it or are you just making assumptions? As for the charger not being "free": I know this. I never said it wasn't going to cost someone money. I feel that Nintendo should bite the bullet and take the loss. I again believe the loss would be negotiable in the long run. Based on you what you said, including the adapter would cost $1. So it would cost Nintendo $1M to include it with 1M 3DS XLs. Now how much money are they making on the 1M 3DSes? Edit: The comments here are starting to go wildly off topic. If you guys want to continue this discussion, may I suggest we move it to the forums? @Gumby: No, I'm not sure, but I'm making an educated guess. The $1 figure was a guesstimate. I've really got no idea how much those things cost to the manufacturer, but I imagine it's in that ball park. That $1M is $1M they don't have to lose. Sure, it's OK for you to wish that Nintendo would bear the cost, but you have to remember that businesses these days are looking to shave cents off unit cost prices - $1 per unit is not a small amount. They obviously feel that enough people own a compatible charger that it's not worth it to include one. That's not to say that EVERYBODY will have a charger, but Nintendo wouldn't have made this decision on a whim. You forgot the loss on the charger AND the system. When I buy a cellphone, the charger is included. When I buy a car, the battery can be charged while driving. No need to buy it seperate from the car. When I buy a 3DS XL I can uce the AC adapter from my 3DS but can't sell my 3DS without an adapter because the adapter of my DS Lite doesn't fit. At least Nintendo should have used a mini-USB connection like all the new cellphones have now. They only sell the XL without adapter for financial reasons, not to pleasure the customers. What is the difference for me to buy a XL for €199 when I have to buy an adapter for €10, it's still over €200 what I have to spend? When Nintendo decides to use the mini-USB standard its fine for me, almost everyone has those adapters at home nowadays. And whats next? Leave the adapter and tablet out the box for getting the Wii U under €200 sale? Again, my stance on this come from the idea that Nintendo is putting their financial gain over the customer, which is not something they are known for. The whole idea just leaves a sour taste in my mouth and the reasons they give are weak at best. Again this is in my opinion. PLUS, how do you know they have them in bulk? Neither of us work there. @GumbyX84 You're talking about Apple, and smartphones in general. When I got my cell phone here a few months back, it was going to cost me around $7usd. Look, I know this is a difference of opinion, and that's fine. For me personally, I agree with the companies for not automatically including them. For Japan anyway, this is a smart decision. I can't be sure about other regions, but automatically including it here would be very wasteful, since SO many people already have it. And like I said before, this idea is becoming quite common in Japanese companies now, and it is partially a waste issue. I know a lot of towns don't like them being thrown away in the garbage, and there's a changing attitude towards wasteful practices in general. And yes, I'm sure price is part of it as well. @Kohaku I don't think you can compare a small charger to a car battery, that comparison is a bit much, don't you think? EDIT: fixed spelling errors, my English is getting bad. @Kohaku: That's a ridiculous comparison. Nobody has a Wii U tablet already, whereas many people may already have a compatible charger. It's absolutely for financial reasons. No one is saying it isn't. It's just that I don't think it's quite the big issue people make it out to be. If they had somehow tried to disguise the fact that a charger was not included, only for you to find out when you get home that you don't have one, then that would be bad. However, it is CLEARLY marked in several places on the box that it's sold separately. I completely agree that a USB charger would be better, but that's not currently the case. I just think that, as long as you can buy a charger at the same time as you buy the console, this is a complete non-issue. The way I see it, there is exactly ONE charger for every DSi=XL/3DS=XL out there. Then they have to go into overtime, usig the money from the systems to make more. I agree. What's another $5 gonna do? Starve you? @YelloWishua I will openly state that this is an educated guess based on what I believe are normal manufacturing practices. As for the cost of buying a new adapter: I never said that was the problem. I said I don't find their reason for not including the adapter good enough. And I don't know about you, but I'd rather spend the $5 on a Subway sub than a AC adapter. @Tsuchinoko Apple was just an example. Many other companies follow this practice. If you want to buy an extra charging adapter for your Nook or Kindle Fire, you must buy one direct from the manufacturer at an inflated price. And while you may not think the same way, I place the Nook and Kindle Fire on the same price point as the 3DS and other handheld gaming devices. Hell, most of the industry does. @GumbyX84 Maybe I don't understand what you mean by "direct from the manufacturer". You mean in a store? Are there a lot of places in your country where you can but a used charger? We have that a lot here. I saw a used 3DS charger for like, 600yen, its like the price of a meal at McDonalds. But with Nintendo chargers, you don't have to buy them direct for just an adapter only, you can pretty much buy them cheap anywhere, used or new. Even in the States or Canada when I lived there I remember seeing them in some places, right? @Tsuchinoko The Nook and Kindle Fire are like the iPod/iPhone/iPads were you must use a first party USB adapter to charge the device if it is not connected to a computer. As for buying used adapters: Yes you can find used Nintendo chargers in Gamestop. I cannot find the price of one online but I believe they are around $7. As for the devices I mentioned above, I have yet to see a used one in a brick and mortar or online store. Many people have a charger but many people dont have that because they never bought a DSi. I have a DSLite and because Nintendo had used for some strange reasons different sizes of connectors from the charger the people with a DSLite had to buy a new charger. When you wanna sell your 3DS you have to buy a new charger. When Nintendo allready starts with saving this little money its not strange for me that they will do something strange with the release from the Wii U also to get a nice price. Maybe we have to use the Wii adapter so Nintendo can save money. For me there is no difference. You buy something with a battery(pack) in it what has to be charged. It think its a rediculus decision not to include a charger. Its not like its an optional extra and you can choose not to charge it and maybe put aa batteries in it, You simply cannot use the appliance without one. It doesnt really effect me as I have no intension of upgrading, I'm quite happy with my ordinary 3DS but I can see why so many people would be upset by it. @Kohaku And that's why its a difference of opinion, and like I said, its fine. All I'm trying to do it to show you the positive side. I also think its a cultural difference too, I even addressed my first message to the writer of this article since he noted that there might be complaints in Japan about this issue, and while some might, this is generally not a unique issue here, and chargers are really easy to come by, and most people have them already. I believe that in North America, they are still including the charger, and that's what works for them. I think its better too, since the amount of people who don't have a 3DS in NA is still pretty big, but its the opposite here. If you're asking me whether i think its a strange decision for Nintendo of EUROPE, well then, I don't know enough about that specific issue to be able to comment, all I can do is present what we have here. @lumaliance Wait, what? We get one? That's good news. Any news if it comes with Cradle though? Cause that's pretty much the only add on I want. @Tsuchinoko "3DS owners who are merely upgrading will have an extra. Its wasted materials." If you are upgrade your 3ds to a 3dsxl (or any system for that matter) you have to give the charger too so the people who are upgrade will still have to buy another charger. My local gamestop or hmv won't take a system if it doesn't have the cables that came with it. The biggest problem I see, is that to sell a 3DS or a DSi you must also include the charging cable. You'll find that most people would not have a charger, if you remove the one that came with the system. For anyone looking to trade in an older system for the new one, this is likely an issue, not to mention those who will buy this as their first Nintendo handheld (or at least first with this type of cable). This seems like exactly the same mistake Sony made with the Vita, forcing buyers to purchase the memory cards separately. You cant play the 3DS without a game either yet no-one is complaining about the fact that you have to buy them seperately as well. You don't need to buy the 'official' charger - many cheap chargers are available on Amazon. If you want a charging cable to charge via a USB connection then they can be found on Amazon for as little as £1.49 with free delivery - or a traditional wall charger for £2.89. The simple fact that Nintendo is not including what is essentially required for the 3DS XL is just stupid. I'm glad to see that NOA didn't take this idiotic route. 8 quid at shopt. NEVER think of the 3DS as only 179.99 pounds in the EU. It's a good thing NA is getting the adaptor included, but wow Nintendo I'm really surprised they're making this decision in PAL regions. I thought it was bad that Sony stopped including USB data cables with PSP's back in the day but this is just ridiculous. It would be different if the XL used triple A batteries or something but the damn thing requires an AC adaptor to even be USED. I thought Nintendo was more conscientious of their consumers, guess I was wrong. @Neram Like I said before, if Nintendo of EUROPE had their reasons, then that's the issue here. A lot of people are calling out the entirety of Nintendo, but it could be said that there are multiple Nintendos, and what works for Japan may not work for Europe. @Assassinated That's not a universal thing. I think there's a lot of places here where you can trade your 3DS or merely sell it without including the adapter. Some unconfirmed reports that some shops will allow u to do the system transfer in store. However, that'd be a nightmare for the store to organise and how would they spare one member of staff to supervise u doing that? Especially now considering GAME and Gamestation will probably have less staff than before. there's a system transfer option inside the 3ds option menu. you can move your 3ds's "brain" (i'll call it that) i think 6 times before the system is like "no you, stop being picky about systems and colors"
Maybe in the Japan/Europe systems they should include a code for $5(or equivalent) in eShop funds? They should do that in Europe, since in Europe they won't include a AC adapter with the 3DS XL!! Also considering many an unofficial charger has destroyed my blackberry, think I would be inclined to get an official charger! Wow, they have it WAAAY, lower than we do here in the U.S. I saw it $19.99 the other day.